Yellow Rock may have cracked the holy grail by making analogue solid-state sound as good as, if not better, than valves. Clever design; response of a valve output stage; solid-state reliability and consistency. The boost level is fixed, but this can be adjusted to taste as all Yellow Rocks are built to order. Yellow Rock’s CA35H head is a new arrival on the boutique scene, made in Guernsey by founder/designer Robert Card, who brings a refreshingly open-minded approach to his work. Card’s electronics background includes stints at the BBC’s legendary Equipment Department in Chiswick, working on local radio broadcast consoles, and at University College London, where he worked in the world-renowned Mullard Space Science Lab, designing power supplies for satellites and space telescopes. Back on earth, the CA35H is a hybrid design (the H stands for High gain), combining a no-frills valve preamp with a unique output stage design that Yellow Rock calls Analogue Pentode Emulation, or APEM for short. According to Yellow Rock, APEM not only reproduces the behaviour and clip characteristics of a valve output stage, but also the audible power. The CA35H looks reassuringly conventional, with a neat plywood sleeve surrounding a fully enclosed steel chassis and a conventional reverb spring. Inside, there are a lot of electronics, mostly held on four custom-made through-plated circuit boards that have been hand-loaded with very high-quality components. One board also supports a pair of valve sockets for the CA35H’s two 12AX7 preamp valves. The front panel controls use long-life sealed pots, while the CA35H’s juice comes from a switched-mode power supply that takes any standard mains voltage. There’s also a substantial output transformer - something not normally seen on a solid-state power stage. Overall, the CA35H’s close attention to detail and purposeful looks sit comfortably alongside many other top-dollar boutique designs: it’s handsome, built to last and should handle any amount of abuse. Despite the electronics, the CA35H is a straightforward single-channel design, with controls for gain, bass, treble, middle, effects loop level, reverb level and a master volume. There’s a footswitchable gain boost function, a bright switch Yellow Rock calls Twang, and a power switch that switches output power between 35 watts and eight watts. The sparse rear panel has a pair of speaker outlets for four- and eight-ohm cabinets and not a lot else. There’s an LED to show when the CA35H is in boost mode, together with a pair of LEDs that indicate when the preamp and power amp stages are clipping. Once switched on, the APEM circuit takes a couple of minutes to sort out optimum voltages - then the amp is ready to go. The first thing we notice is an almost total lack of noise, making us wonder for a second or two if we have a loudspeaker connected. Turned up to a decent volume and with the gain control at around 12 o’clock, the CA35H provides a warm, vintage bite that sits roughly halfway between AC30 and tweed Champ, which is not a bad place to be. The tone controls operate smoothly, and while there isn’t a huge amount of range, it’s enough to dial in most guitars, with the Twang bright switch adding a proper snap to mid-biased humbuckers. What really sets the CA35H apart is the APEM output stage, which not only has the warm, bouncy response we’ve come to expect from valves, but the power, too. Hitting the boost adds lots of extra gain, providing plenty of drive for classic rock and blues. 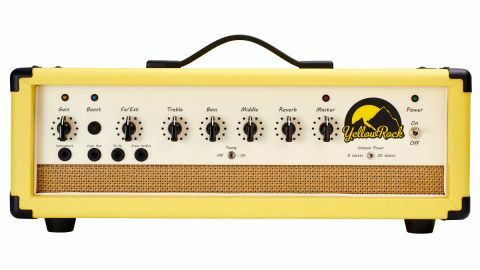 We’re impressed with the Yellow Rock’s spring reverb, too, which has a nice smooth decay with none of the splashiness that affects many reverb circuits. But what really sets the CA35H apart is the APEM output stage, which not only has the warm, bouncy response we’ve come to expect from valves, but the power, too. Those 35 APEM watts into a 2x12 speaker cabinet are easily enough to handle any size of gig, and even on the eight-watt setting it’s more than enough for home use. For a first entry into the crowded boutique market, the CA35H has a lot going for it, and considering the clever internals, it’s pretty good value compared with other boutique heads. The preamp is super quiet and takes effects really well, while the clever APEM power stage really does sound like a quality valve circuit, without the frustrations all valve amp users have to contend with. Yes, valves sound great, but they’re fragile and they wear out, so the sound you get when you switch on tomorrow will be imperceptibly different to the great tone you dialled in today, and six months down the road those imperceptible changes add up to a big difference that may only be cured by new valves. However, if you can use a solid-state amp that sounds - and more importantly responds - like a valve circuit, with rock-solid reliability and consistent tone night after night, what’s not to like?